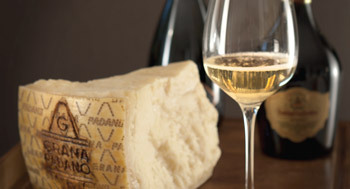 The range of Italian wines is truly vast and unique, but with Grana Padano at its three ageing stages, a glass of Italian sparkling wine produced with the classic method, like Franciacorta DOCG, Trento DOC, Alta Langa DOC, Oltrepò Pavese DOC and Lessini Durello DOC is always a popular and intriguing accompaniment, especially as an aperitif. The many different styles and nuances of Champagne match the various ageing stages of Grana Padano remarkably well. The strongly evocative emotional appeal and style of champagne are such that it cannot be replicated anywhere else, exactly like Grana Padano. Indeed, although other wines produced with the same method and grapes may bathe in reflected glory, the magic of champagne is always extraordinary and unique. It is best paired with a young and very fresh Champagne initially fermented in stainless steel tanks or concrete vats. A Blanc de Blancs made from Chardonnay grapes, with a pleasant, lively, nervous and racy flavour and a certain amount of acidity, though perfectly balanced, which make it fine tasting and an easy to drink wine. It is excellent paired with Grana Padano PDO, whose immediately pleasing and flavoursome taste brings to mind the characteristics of milk and cream. GRANA PADANO PDO "OVER 16 MONTHS"
It is best paired with a Champagne made from a blend of vintages, with a dosage of vintage wine and cane sugar. A Champagne that is no older than a 2000 vintage, tastes compact, dense and very creamy and gradually releases distinct hints of nuts, such as hazelnuts, hay, dried flowers, citrus fruit and a wonderfully crispy crust of lightly toasted bread. It is an excellent combination because it counterbalances the sensation of fattiness and helps perceive the “grainy texture” of the cheese, which is savoury but never pungent. We suggest combining this cheese with a Champagne of substance, with the first fermentation carried out in wooden vats followed by in-bottle fermentation with a very long period of maturation using selected yeasts. It is best if the blending is done with wines from the same vintage, which is an indication of the product's uniqueness. Excellent combinations can be created with great vintages such as 1996, or the sublime 1990 vintage, with aromas ranging from hints of almond through to dried fruit and citrus fruit. These vibrant and warm champagnes release hints of fruit and toasting, and have a robust body and persistent finish. To better appreciate it with Grana Padano Reserve, it is best not to chill it below 12° in order to fully enjoy combining it with this utmost expression of Grana Padano, which still combines sweetness with savouriness and perceptibly pungent hints. previous: Which wines should accompany Grana padano? next: Which beers should be combined with Grana Padano PDO?